The Avg. Group Discount is 38.7%! We enjoyed our stay as the hotel was clean and welcoming. It's located so close to the beach that you can enjoy the sounds of the surf while relaxing in your room. 13-Mar-2019 Verified Review, stayed from Fri Mar 08 to Mon Mar 11 2019 at a $219.78 average nightly rate. Individual Reservations have a 72 hr cancellation policy/Group Cancellations vary. 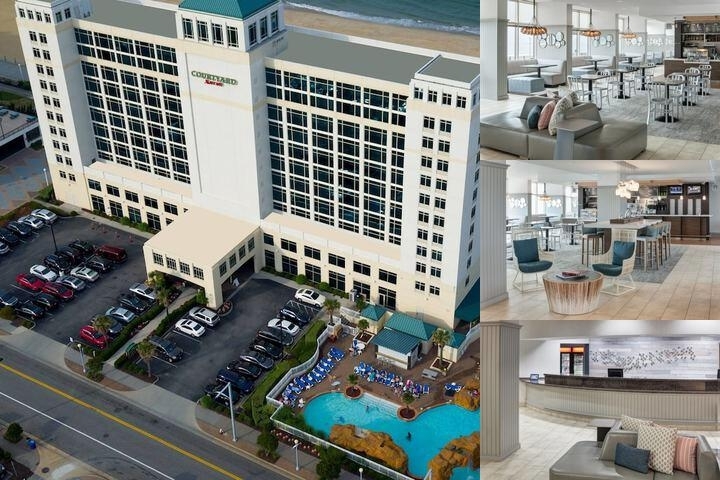 Below are the meeting, banquet, conference and event spaces at Courtyard Virginia Beach Oceanfront North. Feel free to use the Courtyard Virginia Beach Oceanfront North meeting space capacities chart below to help in your event planning. Hotel Planner specializes in Virginia Beach event planning for sleeping rooms and meeting space for corporate events, weddings, parties, conventions, negotiated rates and trade shows. Our Cape Henry Ballroom is oceanfront with floor to ceiling windows for breathtaking views of the ocean. It is 1537 sq feet can be divided into 2 seperate rooms Salon A 912 sq feet and Salon B 625 sq feet. 50 x 26 x 10 Ft.
Our Executive Boardroom is great for small meetings. It features a large wood grain conference table and 10 very comfortable executive chairs. There is a built in white board, flip chart, and pull down screen. 11 x 17 x 7 Ft.
25 x 26 x 11 Ft.
38 x 25 x 11 Ft.
50 x 26 x 11 Ft.